Welcome to the Yurt City Blog, an ongoing site about Yurt City, an ongoing collaborative sculptural project by New York based Canadian artists, Sheila Ross and Laura Ten Eyck. Yurt City first installed at Dam Stuhltrager gallery in 2006. 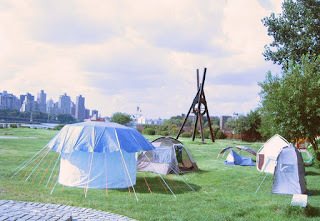 Yurt City II, a second incarnation of this project was included in FLOAT a biennial exhibition at Socrates Sculpture Park. YC3, a 3rd incarnation will open on May 2nd, 2009 in Riverhead, NY at Artsites gallery. Stay tuned for more postings about the project, images of past yurt cities and information on the upcoming YC3.